Many people have questions about various aspects of their pet's surgery. One of our goals is to make sure any questions you may have are answered prior to your pet's surgery day. Please read below for answers to our most common questions. If you have additional questions, please let us know and we will be happy to discuss your pet's surgery in detail. We will call you 1-2 days prior to your pet's surgery to confirm your appointment and answer any questions you may have prior to coming in. Please fast your pet (do not feed) 8-10 hours prior to any anesthetic/surgical procedure to reduce the risk of vomiting during and after surgery. Water is okay until the morning of surgery. *Rabbits should NOT be fasted. Diabetic patients may require special instruction. Drop-off time for surgical and anesthetic procedures is between 7am and 9am. Please plan on spending 10-15 minutes to go over the surgery plan, discuss recommended blood testing & other options available, discuss estimates, and to sign required consent forms. 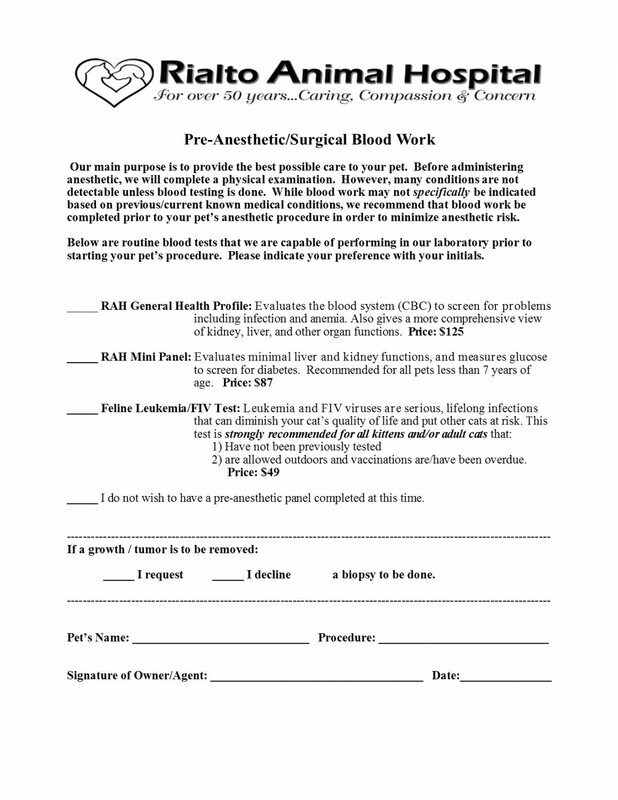 You can speed up the check-in process by printing and completing our Pre-Anesthetic/Surgical Blood Work Form. Once in surgery, every patient is assigned a surgical assistant that will stay with your pet from the beginning of the procedure until your pet is fully awake. Once your pet begins to wake up, we will call to update you on your pet's progress and schedule a pick-up time. Please allow at least 15-20 minutes when you arrive for your discharge appointment. We will go over important discharge information, aftercare instructions, medication instructions, and answer any questions you may have. Here at Rialto Animal Hospital, we take anesthesia safety very seriously. Our top priority is to maintain the health, safety, and comfort of your pet throughout the entire anesthetic procedure and recovery. To ensure this, we have designed an anesthetic protocol that is among the safest in the veterinary profession. To read about our anesthetic protocol, please CLICK HERE. Why is Pre-anesthetic Blood Testing Strongly Recommended? Pre-anesthetic blood testing is important in reducing the risk of anesthesia. This gives us the most complete picture of your pet's overall health and organ function. Even apparently healthy animals can have serious organ system problems that cannot be detected without blood testing. If there is a problem, it is much better to find it before it causes anesthetic or surgical complications. Analysis of pre-anesthetic lab work also allows us to customize an anesthetic plan to specifically meet your pet's needs. If serious problems are detected, surgery can be postponed until any problems are corrected. If you haven't already completed a recent blood panel (within the past 6 months), we recommend that you review our Pre-Anesthetic/Surgical Blood Work Form prior to your arrival so that you may be familiar with the blood panels available, their associated costs, and so that you can be more readily prepared to make this decision during check-in if you haven't already decided. For some surgeries, such as canine neuters, we use absorbable sutures underneath the skin. These will dissolve on their own, and do not need to be removed later. Many surgeries, especially spays and tumor excisions, do require skin stitches. With either type of suture, you will need to keep an eye on the incision for swelling or discharge. Most dogs and cats do not lick excessively or chew at the incision, but this is an occasional problem you will also need to watch for. If there are skin sutures, these will usually be removed 10 to 14 days after surgery. You will also need to limit your pet's activity level for a time and no baths (or swimming!) are allowed for the first 10 days after surgery, as moisture can cause infection at the surgical site. For dogs, we may recommend an oral anti-inflamatory the day of surgery and several days after to lessen the risk of discomfort and swelling. We use newer medications, which are less likely to cause stomach upset and can be given the morning of surgery. The cost of the medication ranges from $30 to $75, depending on the size of your dog and type of procedure performed. Because cats do not tolerate standard pain medications such as aspirin, ibuprofen, or Tylenol, we are limited in what we can give them. Recent advances in pain medications have allowed for better pain control in cats than ever before. We administer a pain injection 10 minutes prior to surgery. After surgery, injectable pain medication is given on a case by case basis. Any animal that appears painful will receive additional pain medication.